Your Back in Stock account settings provide several options to control delivery. There might be situations where you want to temporarily disable customer notifications being delivered. To disable delivery visit your account page. Uncheck Deliver notifications to customers and hit Save. When you do enable delivery again Back in Stock will send customer notifications that are in stock at that time. You may wish to only notify customers when you have a minimum quantity of inventory available. The default of 1 will send customer notifications when a product has 1 unit or more in stock while a higher value requires more units. For example, a busy store may set a minimum quantity of five to send. Customers will only be sent a Back in Stock notification if there are five units (or more) of inventory. Enable this setting to have Back in Stock notifications sent when a product is available to purchase as a 'preorder' product. Back in Stock normally looks at the inventory quantity to determine if a product is in stock: if the quantity is greater than zero a customer notification will be sent. Sometimes you may wish to set a product to "Allow purchases when sold out" and not track inventory on the product. If you have products setup like this, and would like to send Back in Stock notifications for them, just enable this setting. When sending customer notifications for products that are "Allow purchases when sold out" any minimum quantity or delivery policy settings for your account will be ignored for those products only. For popular items you can easily end up with a lot of customer notifications. You may even have several times the quantity of inventory being replenished. With a Delivery Policy enabled you can restrict the number of customers being notified at once. For example, you might have 1000 customer notifications registered for a Medium Green Jacket. You are only able to source 80 units of this jacket from your supplier. If you notify all 1000 customers at once your jacket will sell out but many customers will miss out on purchasing. Enabling a Delivery Policy restricts the number of customers notified based on the quantity of inventory available. 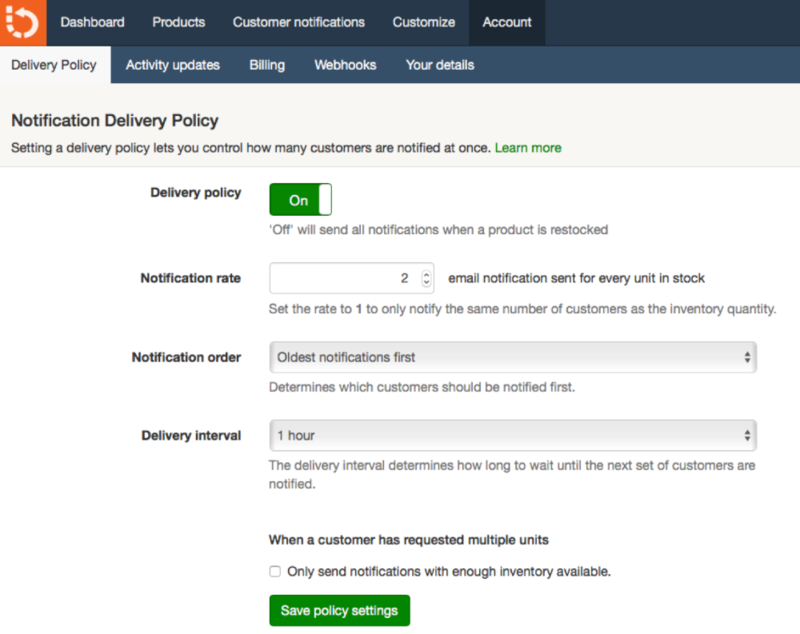 Your store Delivery Policy can be enabled and customized from the Delivery Policy settings page. NOTE: Setting a Delivery Policy is only available to accounts on a paid plan. To access the Delivery Policy controls, choose Account from the Back in Stock main menu, and then choose the tab labeled Delivery Policy. Notification rate: You can choose to notify a greater or fewer number of customers than the quantity of inventory you have available. For example, setting a notification rate of 1.5 would notify 120 customers when 80 units of inventory is available (80 × 1.5 = 120). Notification order: The Notification order allows you to choose what order to work through the notification list. You can choose to notify either customers who have been waiting the longest by choosing Oldest notifications first or notify the most recent customers by choosing Newest notifications first. Delivery interval: Setting the delivery interval lets you control how quickly the next batch of customer notifications is sent. You can choose either Daily or Hourly. Multiple units: Only applies if your account uses the Quantity required field. With this option enabled customer notifications will only be sent if enough stock is available to fulfill a customers desired quantity. For example, if a customer has requested a notification and entered the required quantity as 4, that customer will only be notified once 4 units are available. Note that the calculation is not cumulative: if two customers have requested 4 units of a product, and six units becomes available, both customers will be notified. If you don't use the Quantity required field this setting has no effect. You can disable the Delivery Policy by unchecking the Enabled checkbox and clicking the button labeled Save Policy Settings. Your settings will be preserved, so you can always enable the Delivery Policy again later. When using a fractional delivery rate (such as 0.25) the number of notifications to send will be rounded to the nearest whole number. For example, a rate set to 0.25 with 30 units in stock would send 8 customer notifications (30 x 0.25 = 7.5 and then rounded up to 8). If number of notification to send is between zero and one it is always rounded up to one (for example: 0.25 x 1 = 0.25 but rounded up to 1).